Melodic Heavy Metal with tinges of Folk music hailing from the beautiful, snow swept landscapes of Sweden? YES, PLEASE! Scandinavian quartet REXORIA are a welcome treat for the ears, as their first full-length effort bursts with energy and originality. "Queen Of Light" shines with a luminosity all its own, yet makes it apparent that its sound was influenced by many of the masters, including (but by no means limited to) Yngwie J. Malmsteen's RISING FORCE, JUDAS PRIEST, NIGHTWISH, and WARLOCK. In fact, not since Doro Pesch has a female vocalist pulled off such feats of melody and power, in my humble opinion. Straying far from the Nu-Metal nuances of acts such as EVANESCENCE and the ilk, REXORIA chooses to keep it old school, and the result is something special. From the moment the intro is eclipsed by the opening chords of the first true song, "Stranded", it becomes crystal clear that this is going to be a throwback to a time when Metal took a turn towards a more melodic and power chord-heavy structure (c. 1983). Yet the album shows a propensity to dip into newer areas of Metal at the same time, without teetering over the edge into sell-out territory. It's so refreshing to hear such a mature release come from a band that put forth only two short EPs previous to this record. The layered vocals of Frida Ohlin are like white rose petals skimming the top of a serene lake's black waters, its ripples sparkling in the light of the fullest of moons. The music behind her voice is rich, flowing, and steady, providing a wondrous mixture of formal Heavy Metal and Norse Folk music, thus accompanying the vocals very nicely. 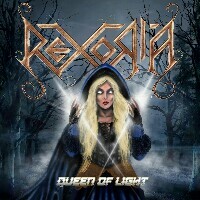 The title track on REXORIA’s "Queen Of Light", which makes its appearance at track number three, does a fine job at settling the listener in for the pleasant ride that is to come. As the album progresses, the mood switches between moments of dark despair and fleeting hope, yet never loses hold of structure and integrity in the process. It is a level of artistry rarely reached by a musical group on their first LP. Then, it happens: track six, "Song By The Angels", floats into existence; its sorrowful guitar and sweet synth strings breathing underneath the deep and ominous voice of Frida Ohlin as if they came from the mouth of an ice dragon. The song quickly breaks into a power ballad, sailing like a mighty ship through a raging sea of sound. The lyrics preach of sorrow and loss, and the power of music to take one away from it all. It is the perfect bridge for one to cross over while venturing into the second half of this great and entrancing Metal record. "Queen Of Light" roars on, taking the listener back to a time when pure Heavy Metal was in its prime. It's not as if music like this has never been created before; rather, it's the fact that few, if any, have had the capacity to perform it with such vigour and tenacity the way that REXORIA can and does. The eighth song, "The Saviour", is somewhat of an anthem, and strays a little bit into Nu-Metal territory more than the rest of the album does. This being the case, it does so without becoming cliché, holding onto its appeal throughout its entirety. While most albums in this category tend to end on a slower note, "Queen Of Light" closes out with real and true Heavy Metal intensity, its last two tracks causing the listener to feel like a Viking sailing towards a war-torn shore, the anticipation of fierce battle weighing upon their mind and heart. This record, while certainly not something that hasn’t been attempted in the past few decades on multiple occasions, shows us that rooted Melodic Metal is far from dead, and that the soul of this wonderful music still lives on in the hearts of the few, the brave and the talented – and with them a new band from Sweden named REXORIA.